There’s nothing more frustrating than being passed over for a job you wanted time and time again, especially when you feel like you’re one of the most qualified candidates. Unfortunately, hopeful applicants experience rejection from potential employers every day. If you’re not sure what could be going wrong, check out the following list to see if you have made some of these mistakes in the past. While there’s no doubt that you are qualified on paper, you have to be able to display your skills in person during your interviews. Fix some of the things that could be potentially holding you back, and you will be that much closer to receiving a job offer (or multiple ones). You lacked interview skills – It’s easy to say and do all the right things in written form, but in verbal form, it’s a whole different situation. While sitting directly in front of a hiring manager, it’s important to show confidence in an interview even though you may be nervous. Always refrain from talking poorly about your previous employer or colleagues and never complain. Companies want to hire someone with the right attitude who is personable and involved in the interview process. So, make sure to ask questions and follow up after the interview is complete. You didn’t do any research – Before walking into an interview, you should already have an idea of what the company does and how you can help contribute to the organization’s success. You need to sell yourself on why you would be an excellent fit for the role. Plus, how do you know if you’re really qualified without doing your homework first? Spend 20-30 minutes browsing the company’s website so that you’ll be prepared to discuss anything relating to that position/organization. You came off too desperate – While it’s perfectly acceptable to be enthusiastic about a potential job, employers are still going to hire someone that is best suited for the job overall. Never make it seem like they would be doing you a favor to hire you. Instead, show and explain why hiring you would benefit both you and the company. You didn’t follow instructions – If a company asks you to bring in your ID, a list of references, copies of your resume, etc., they’re asking for a reason. If you can’t follow simple instructions for the interview or give excuses for why you’re unprepared, an employer is going to assume you won’t be able to take the job duties seriously. Not being able to follow instructions is also one of the main reasons why many candidates don’t make it to the interviewing stage. You looked sloppy – Have you ever heard of the term dress for success? Well, it exists for a reason. First impressions are important, which is why you should be well groomed, look professional, and be respectful. Sloppiness shows you didn’t care enough to prepare for the interview. Make sure your hair is brushed, your clothes are stain and wrinkle-free, you smell nice, and you look put-together. You shared too much information – A job interview is not the right place to talk about personal issues. Keep your answers brief and direct and try your best not to over-explain or go into unnecessary details. 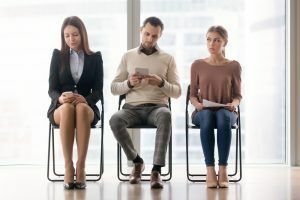 You didn’t have the right body language – Non-verbal cues play a considerable role in helping a hiring manager decide between candidates. If you’re someone who has a weak handshake, doesn’t keep eye contact, always fidgets, or just seems awkward, you are hurting your hiring chances. While an interviewer may understand you could be nervous, still keep a good posture, smile when necessary, and make eye contact. This type of body language will help you avoid distracting behaviors while exuding confidence. You weren’t memorable – To get a job offer, you have to stand out from the crowd. You can do this by building a real connection with the interviewer. Listen to what they have to say and explain why you would be the perfect fit for the organization. And, to show the interviewer you were listening, and that you’re still interested in the job, mention something you and he/she specifically discussed during your conversation in your follow-up thank you note. Having a great resume and cover letter will get you called in for an interview, but to surpass other candidates and be offered the job, you have to have more than qualifications. Avoid the mistakes above by practicing and being prepared. Though it does take time to discover your shortcomings, it’ll be well worth it in the end. If you’ve done all you can to get a job but still aren’t moving forward, you may need the help of outside sources. Programs such as LifeWorks, which is offered by The Jobs Partnership, was created to help individuals like you who are either unemployed, underemployed, or feel stuck in their current job. LifeWorks is a different kind of training that opens up a whole new world of career possibilities. Apply for our no-cost, life-changing training course today or for more information, contact The Jobs Partnership by calling us at 407-641-0755.